﻿ Group A02 | Project Overview | Science of Slow Earthquakes - Grant-in-Aid for Scientific Research on Innovative Area, MEXT, Japan. Various types of slow earthquakes have been found in a number of plate boundaries, particularly in subduction zones. The world's most diversified activities of slow earthquakes have been discovered along the Nankai Trough and Ryukyu Trench in western Japan. However, regional factors controlling the difference of those activities, interactions among regions and relationship among different types of slow earthquakes have not been clearly explained yet. Group A02 conducts an observational research to precisely detect activities of slow slip events (SSEs), the largest type of slow earthquakes that are thought to control the macroscopic patterns of slow earthquake activities and interplate slip modes, in some areas in western Japan where SSE activity is high by using multi geodetic techniques such as GNSS, tiltmeters, strainmeters, and gravimeters in order to address the regional characteristics of the interplate slip property, factors controlling them, interactions among activities in neighboring regions and relationship between SSEs occurrence and crustal fluid. Further, we aim to redefine the earthquake phenomena through understanding slow earthquakes by integrating findings from other research groups, such as observational results, laboratory experiments, and numerical models. Figure 1. Target areas and locations of slow earthquakes. Based on geodetic observation techniques, we proceed following three themes integrally. 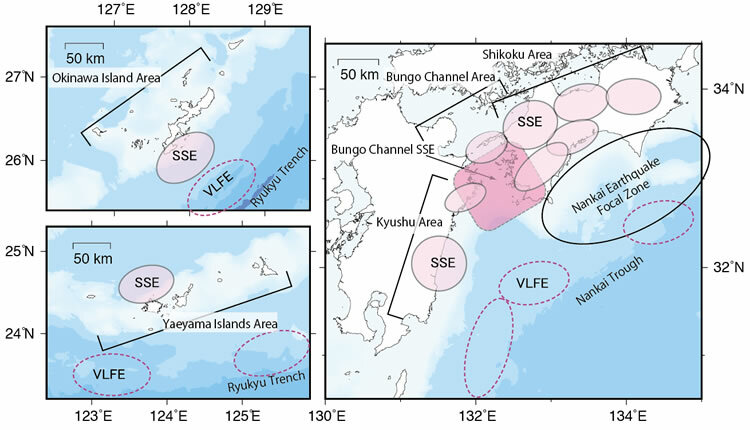 Setting two areas where isolated SSEs occur once or twice a year: 1) the area around the Okinawa Island where SSEs are located in a shallow area on the plate interface; 2) the Yaeyama Islands where SSEs are located in a deep area on the plate interface; as model areas, we conduct continuous GNSS observation in island areas not covered by GEONET (nationwide GNSS observation network operated by Geospatial Authority of Japan). We study the environmental factors controlling slip characteristics on the plate interface in those areas by clarifying the mode of SSE activity, such as recurrence intervals, slip duration, depth ranges, and so on. We try to detect gravity changes associated with the occurrence and progress of SSEs using portable and continuous gravimeters in order to determine the effect of crustal fluids existing in SSE areas on the generation of SSEs. By this observation with high temporal resolution, we improve the identification accuracy of crustal fluid behavior at depth.